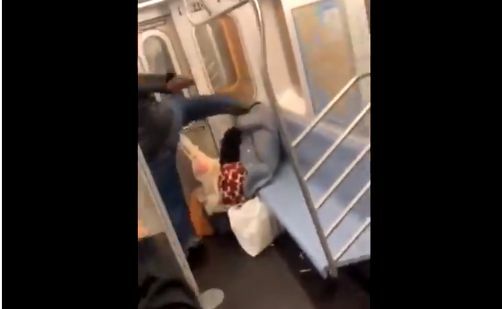 NEW YORK — A man who attacked an elderly woman on a New York subway earlier this month by kicking her in the face has been identified and arrested by police. According to reports, shortly after 3 a.m. on Sunday, March 10, Marc Gomez, 36, began kicking the woman who was sitting alone on the No. 2 train, and struck her repeatedly in the face and upper body with his foot. The 78-year-old tried to block the blows with her hands. Bystanders did nothing to stop Gomez, but instead seemingly took delight in watching the attack, exclaiming “Oooh!” and recording with their phones. Gomez then walked off the subway car seconds later and stated to those recording, “WorldStar that, my n****r,” referring to the hip hop website that uploads videos of violent attacks or fights. The New York Times reports that the woman was met by EMS personnel upon reaching the next station and was treated for cuts to the face and swelling. Video footage of the incident was soon posted online and the New York Police Department sought tips from the public regarding the identity of the assailant. According to reports, an anonymous tipper informed police that Gomez frequents the Lower Manhattan area. He was subsequently arrested on Saturday and charged with felony assault. “He’s crazy; that’s somebody grandmother,” one poster wrote in sharing the footage online. Alisa Cox, who is engaged to Gomez, alleged to the New York Times that the woman had threatened her and her 11-year-old daughter as they were heading home from a birthday party. She also told the New York Post that the woman “kept going off about stabbing and killing people,” and that Gomez was seeking to defend her and her daughter as he thought the woman had a knife. Cox said that Gomez felt remorse following the incident. The woman is reportedly homeless and has mental health issues. As previously reported, Jesus taught in Mark 7 that evil of various forms begins in the heart, and manifests outwardly.